The match which will be broadcasted on Star Sports 1,2, Select HD, Hindi/HD will begin at 8:00 pm with the toss slated for 7:30 pm. The teams will be revealed alongside the toss. With another thriller beckoning our way, a run fest in what is on our cards when some of the finest bat in the riveting tournament take to a track conducive to batting. Expect the likes of Virat Kohli, Rohit Sharma and AB de Villiers to open their arms and find the boundary at will in an enthralling show of batting masterclass at the Wankhede Stadium. Having stayed true to its nature throughout the entirety of the Indian Premier League, the surface has seen batsmen amass a bagful of runs once they’ve found their groove in. The gaps are extremely easy to find with the ball coming on beautifully onto the bat and the short boundaries promise for a 180 run plus match. There will be some purchase for the quicker bowlers early on with the surface providing pace, swing and bounce. The side winning the toss will be looking to field first. We expect the Mumbai Indians to win this. The sides have already met earlier this season in match number 7 which had seen RCB being put down with ease. RCB and MI had met twice in IPL 2018 with both the sides winning their respective home matches. Joseph injured his shoulder in the last match and is likely to miss the match with Malinga coming in for him. Dale Steyn who replaces Nathan Coulter-Nile is still not available for RCB and will join the team on April 19. 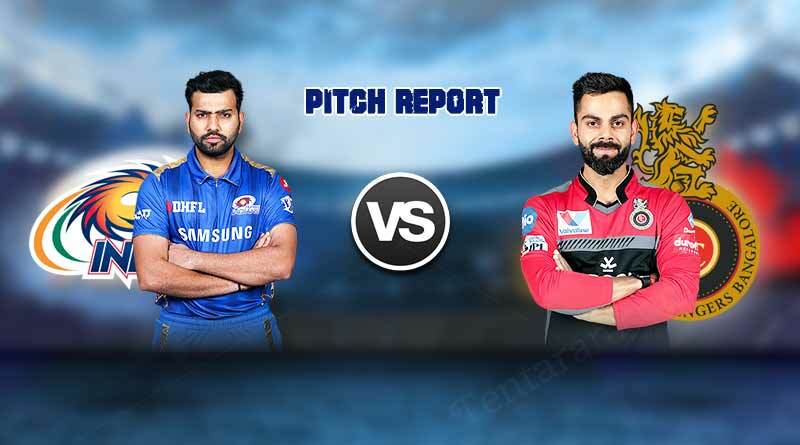 For more articles like ‘IPL match today MI Vs RCB pitch report’, do follow us on Facebook, Twitter, and Instagram.